I would read books all day long every day if there was someone to keep bringing new titles. Now, if that someone happened to be remarkably good looking and had an inexhaustable supply of diet coke, I might just read my life away. I did a pretty good job of keeping track of all the books I read during the last school year (36 in all, I think). I admit it. I’m a nerd, but I’m embracing it. It helps to pass the time. Like the day all the newbies had to get our visas at the Venezualan consulate. We got there at a smothering 5:00 a.m. where we proceeded to wait for 557 hours while we each excreted 362 gallons of sweat. (I never exaggerate. EVER.) But at least I had a book. Then there was the time that I went to a finca with a family from school and it rained for three solid days. In a house where there was no television, no radio, and zero English conversation. But there was Edward and he was enchanting. So, what should I read next? Our book club is reading “Suite Francaise”. Also, I recommend ANYTHING by Denise Hildreth or Sandra Byrd. Both awesome and hilarious. Which is it Em…. Edward or Jacob? I’m about to start the fourth one. I love these books! Oh for the time to read anything more that 20 pages long. Emily, I like to read on my tummy too! That seemed funny to type.. but its true. And your second sentence made me laugh, because it seems to say that if you met someone handsome with diet coke and books.. you would ignore him because you’d just be reading your life away! i HATE the word newbie. 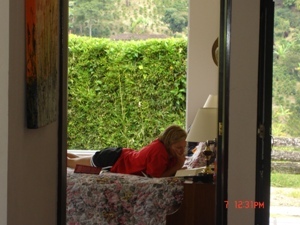 I would read my life away too, if I weren’t currently chained to books I’m forced to read! (I’ve wondered if I’m on the wrong career track–wouldn’t editing books for a publishing company be so much more me??) Wish I could give you book suggestions, but you definitely don’t want to read the the pile I have in my office right now. When you get a chance, email me a list of some of the ones you’ve read lately. There’s always the Christmas break and during the summer!